My comments are related to what I’ve learned from the book Bold by Peter Diamandis. With the advent of social media the crowd model has emerged. The crowd model was relatively evil, initially. It was birthed and organized in social media. The early crowds were used in flash mobs, protests, and riots. Now the crowd is being leveraged for good. What about the creation a crowd church within a community? The church is notoriously known as being “ My local church minded”, isolated and competing with other churches in a community. If the church is to remain relevant it must break out of this model. The church can have a local church vision but must adopt that of the crowd church. Enter web sites Kickstarter and Inidiegogo. One submits products and projects with the potential that interested people will fund them. What about crowd funding through the concept of the crowd church? This is crowd funding for churches within a city, but as important, for the city itself through the crowd church. According to Peter Diamandis there is 15 billion dollars in crowd funding. By 2020 it will be 100 billion dollars. What would occur in a community if the crowd church would fund more for it, than any other enterprise. Would revival break? Exploiting the skills and giftings of the crowd instead of the one person. The apostle Paul calls itthe ministry of the body of Christ versus a one man show. The notion of having a huge prayer line where many wait for the “ ministers of the day” is dinasourish. I am embarrassed to make people wait 45 minutes to get prayed for. Is this unattractive to the church visitor? Release your ministry team in full! If you are the main speaker and people still want you to pray that is fine. But the same Holy Spirit which moves through you moves through the other ministers. I’ve disagreed with brining in special speakers to do conferences while never tapping into the gifted ministers within the church body. Any successful enterprise, except the church, raises those from within their ranks. What about your special speakers be those who serve in your church? It will make your church more dynamic. The power of churches within a community collaborating together. This is not a onetime event for churches, but a way of life for a community. As churches collaborate together the exponential power of collaboration explodes. Churches can meet each other’s needs across a city. The crowd church can meet the needs of the community far beyond any social program. What would occur in a community if its needs were being met more by the crowd church than any other social entity? Churches working together to create city wide events. Not just a onetime event, but a way of life. What if events created by the crowd church impacted the community more than any other type of event? Using the resources of the crowd. This is similar to open sources on the web. This could come as bartering exchanges so that everything is free. 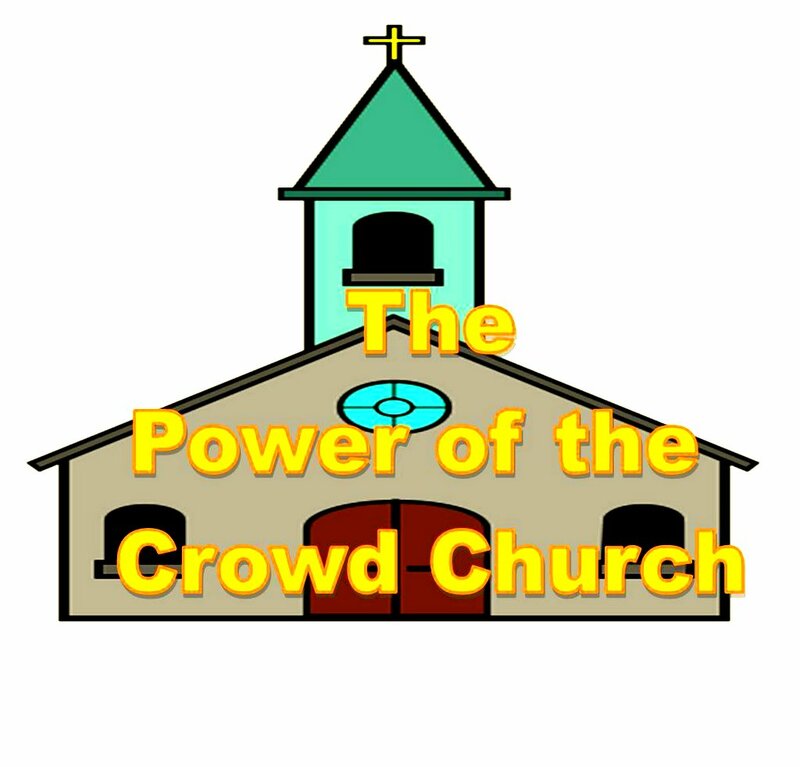 What about the church providing crowd sourcing through the crowd church? This will lead churches within a community into exponential growth. Exponential organization using social networks and automation. Properly built and attractive communities which will impact the city. To finally create a sophisticated church interface which a local community can tap into at any time and any place. This is the power of exponential growth, exponential funding and exponential results through the crowd church. 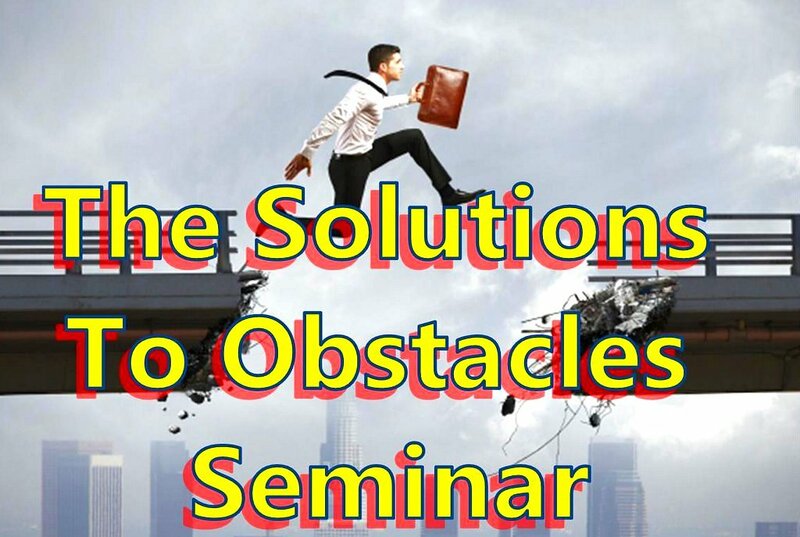 We are excited about our new and interactive seminar. Reserve one for church, business, or home. Brown bag or “fast food restaurant” lunch. a. What if my spouse is not a Christian? b. What if my children are not Christians? c. How can I focus my marriage on God’s Will? Jose and Mary are happily married for twenty seven years. They have focused their marriage and family on God’s voice and agenda. The Alvarez have four adult children. They lived in New Mexico among Native American and in Kenya, Africa. a. How Do I Study The Bible? b. What if a church leader or Christian hurt me and I am not attending church? c. I Don’t Know How To Pray! ii. Intercessory, revelatory, and contemplative prayer. iii. How do I get my prayers answered? a. How Do I Get Out of Debt? b. How Do I Find A Job? Jose and Mary have been missionaries for twenty years. They have been in full time ministry for ten. They got out of debt, destroyed their credit cards and live by faith. You will learn to get a job by the voice of God. a. What If I smoke as a Christian? How do I become free? b. How do I lose weight? 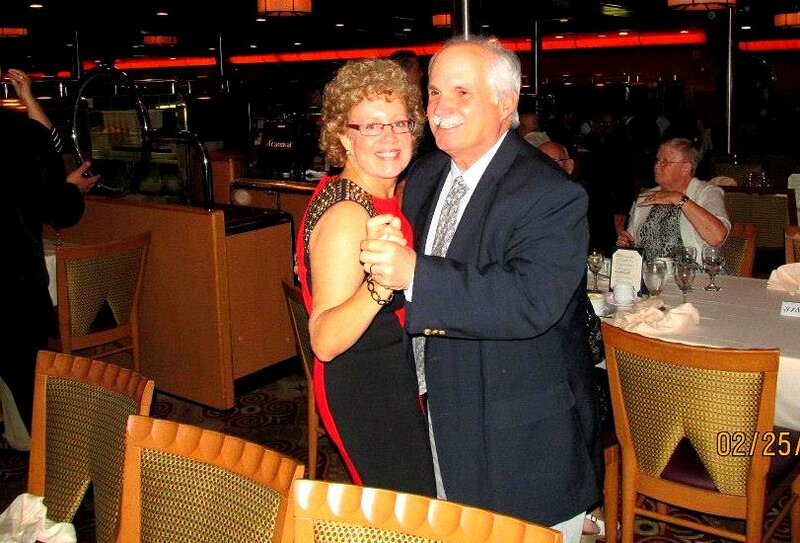 Jose and Mary have lost cumulatively 110 pounds. They were chain smokers and heavy drugs and alcohol users. God set them free supernaturally and without rehabilitation. There is no condemnation in Christ. Learn how! a. What Are My Spiritual Gifts? i. We will administer a spiritual gift inventory! b. How Do I Hear God’s Voice? c. How Do I Prophesy? i. Jose and Mary have prophesied to thousands around the world in twenty years. d. How Do I Get Over My Fears of Ministering? i. Jose was a severe stutterer who could not say his wedding vows. Now he is a Bible teacher. Mary was a shattered bulimic. How did they become free from paralyzing fears? How To Have A Great Marriage ! My wife Mary and I will celebrate 27th year of marriage in 2015. We have had a problem free marriage. By that I mean, no unresolved issues have ever lingered. We have never had an argument that was not fixed that day. Are we special? Of course not! The key to success is putting God and His will always first. Mary and I met in 1986 in church, after her return from the mission fields. We discovered that God had crossed our tracks several times. Our paths intersected at North Miami Beach Elementary School in 1962. I attended there after leaving Cuba. At the school I learned English during the Cuban missile crisis and practiced ducking under desks in case it became real. Right after leaving North Beach, little Mary also attended. In 1977, my family moved from the Virgin Islands, to Key Biscayne, Florida. My parents got a rental on Island Drive. I discovered that Mary’s family left Island Drive, just before our arrival. Is this coincidence or divine destiny? I believe the latter, from a God who knows beginning to end. If you are single, and love the Lord, be encouraged today! God has that perfect one for you, like he had for me. It’s much better to be single who loves Jesus, than to be married, love Jesus, but be married to a guy who hates him. I have frequently observed single Christian women who love Jesus are happier than married Christian women who love Jesus, because their unbelieving husbands pull them down. Enjoy your singlehood, loving and serving Jesus. Trust me, you are much better off. Fret not; God has that perfect one for you. Wait for him. Don’t focus on marriage, focus on Him. I understand the loneliness of Christian singlehood. My advice is that you become married to Jesus. Draw close to and become filled with His Spirit. Most of your loneliness will leave. God brought Mary, when I was contented to be single, even if it was to be so for the rest of my life. I was enthralled and in love with Jesus. I had forgotten about marriage, when my sweet Mary came. I recommend, not to date, but wait for God’s one to come. I have seen many a good Christian fall into the pit of immorality. The flesh is weak, and God knows that. The problem with falling into immorality is that the devil’s condemnation last for months and severely injures the Christian’s walk. Mary and I became great friends but presumed that God had destined us for others. On the same day that I passed my FCC broadcasting test which I had failed twice, God opened our eyes. This was 1987. Now we knew that God was calling us to marriage. God knows how to open doors, and keep them shut. When you are in His will, He can move with blazing speed. After three dates, we knew the calling to marriage and obeyed. Six months later we wed. We were not in love when we married. We joined in obedience to God. The falling in love came after tying the knot. We’ve learned the secret that in everything by doing the will of God and by laying ours down, things always turns out right. We have done many crazy things in the Name of the Lord. But like cats which are constantly dropped from third floors, God makes us land on all fours. God does not have two voices. He only has one . If a couple hears two things, something is wrong. This means that multiple agendas have not been surrendered to embrace God’s one. But this is the secret to a good marriage! Always, and in everything, couples lay down your will, and embrace God’s. He has one voice and one will. Seek ye first the kingdom of God and all things that you wish for will be added to you. Always put parents, children, and families, second, to God and His will. This sounds harsh, but it’s huge. 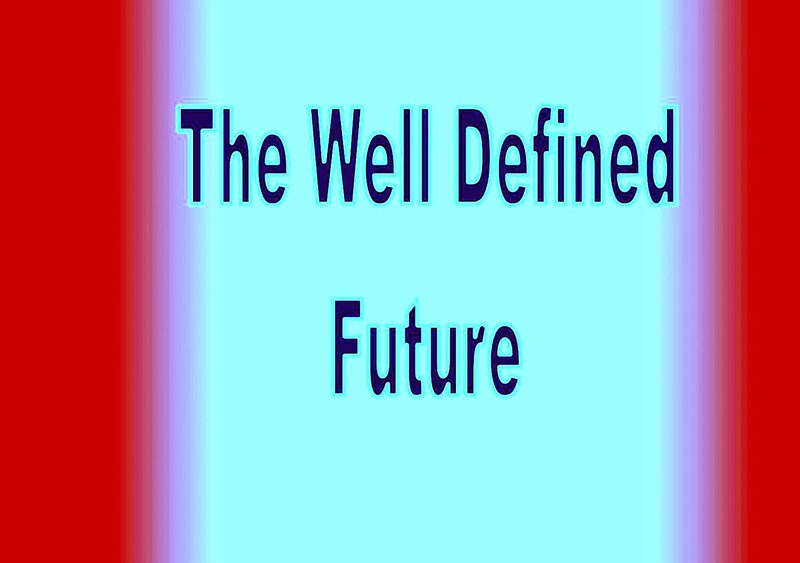 I have seen many put fathers and mothers and children before God and His will, to destructive results. Family idolatry is one of the most damaging things in Christianity. If we put Him above all, He blesses our parents and children with the very best. Mary and I are entirely honest with each other. We do not keep secrets. Good communication is critical. Talking things out and praying them through is crucial. As a family, God taught us to be a team. We have endeavored to do as much as possible together. Our children come before ministry. We let them find their own way with the Lord. We don’t ask them to copy our Christian walk. I have been using the Online Bible program since the 1990’s. I believe that it is the first of the free downloadable Bible programs. The Online Bible has served me well for twenty years. First, download the program unto your desktop. The advantage is that you do not need the internet to use it. On an airplane, or in Africa, you can benefit from this excellent program. I want to teach you some great “Search” features of the Online Bible. On the screen shot as well as in your program you will notice in the available choices on the top; “Window”. On the screen shot you note icons inclusive of a red bible, a lamp and a flashlight. The flashlight is your search figure. You can also use it by the F7 button. Then tap the “set range” button. Click on the “New Testament” circle and tap ok. This sets your search to only the New Testament. In the search box, write “word” and tap ok. 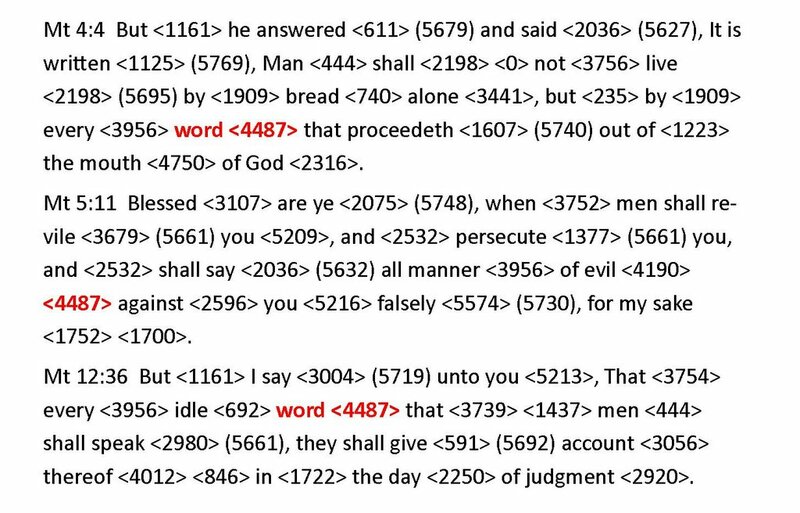 The one hundred ninety seven verses where the word, “word”, shows up on the New Testament are displayed. The Online Bible uses the King James Version as its default. The King James by exceedingly far is the most connected translation to all Greek and Hebrew resources. This brings up the Strong’s Concordance. You will note as I you can see in the screen shots and the program itself numbers bracketed in between <> or (). The <> are your Strong’s definitions. The () are only included for verbs and are represent their parsing. You will note that the word, “word” verse list has such numbers as # 3056 # 4487 and # 2036. This is why it’s vital to have a basic understanding of Biblical languages. In the English, we read the word, word. But in the Greek the meanings of these words are very different and very important. For example, #3056 is the “logos” word which focuses mostly on God’s written word. The word # 4087 which I have delineated on the screen shot is the “rhema” word which focuses mostly on God’s spoken word, through the voice of His Spirit. Scroll down to Matthew 4:4. This is an instance of the rhema word. No click with your mouse on the < 4487 >. The Strong’s Greek definition opens up. Now click on your flashlight or F7. This displays the sixty seven verses where the rhema word appears. Now you can perform a study on the Word of God through His voice. This is an extremely powerful word study. A verse list of 808 verses including “ word “, “words”, “worship” “worlds”, etc. pops up. The * function is important in performing root searches. The program displays eight verses where the words “word” and “faith” both show up. The | is the “or” sign. 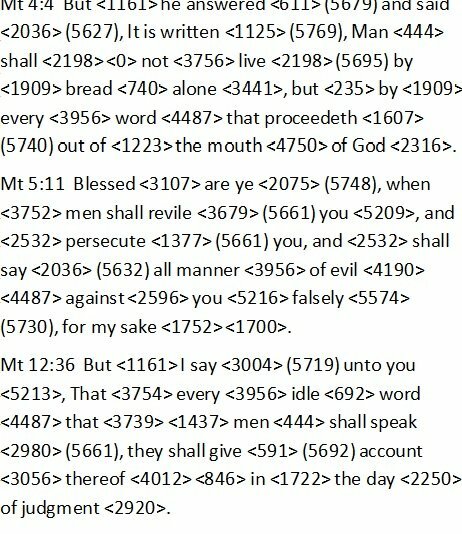 The program now displays 418 verses where either faith or word is displayed. You can also type in the Strong’s number for faith. Our type in 3056 & 4102. You now get ten verses where 3056 which is the logos, the written word and faith show up. Your searches can be infinite and your knowledge of God’s word which sets you free, exponentially increases.